The former county of Gottschee (today known as Kocevska) is geographically located in the country of Slovenia. The map to the right shows the location of the county of Gottschee which lies in the south central part of Slovenia, the southern border of Gottschee near the country of Croatia. The ethnic and linguistic area was about 331 square miles. 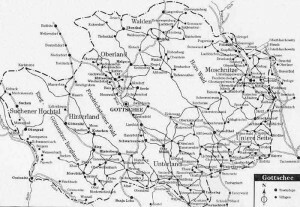 The Gottschee county map below shows the location of the villages. The village names are written in the German language. GHGA has published a map showing names and locations of all Gottscheer villages, including an index that cross-references German and Slovenian village names.